Join us now to June 27. Any time the NFCL is open. It will bring a smile to your face. 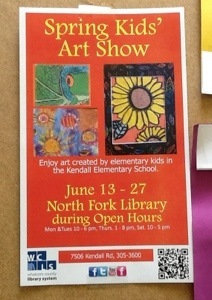 This entry was posted in Library Events and tagged Kids Art, North Fork Community Library, Spring Kids Art Show. Bookmark the permalink.